Apart from domestic manufacturers with which we achieve successful long-term cooperation we managed to make good cooperation with respected foreign supplier. 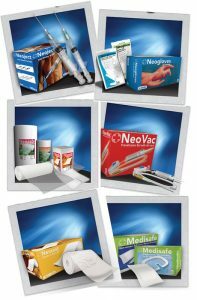 The Company “Neomedic” Limited from London, UK is our supplier of medical disposables. All products are registered in Serbia, have the proper documentation and have all the necessary certificates. Please click here to see the e-brochure of all our products.